If you know me, you know that I love basketball, especially the excitement of college games. I never need an excuse to get a group of friends together, but sometimes I run out of ideas for what to feed a crowd. 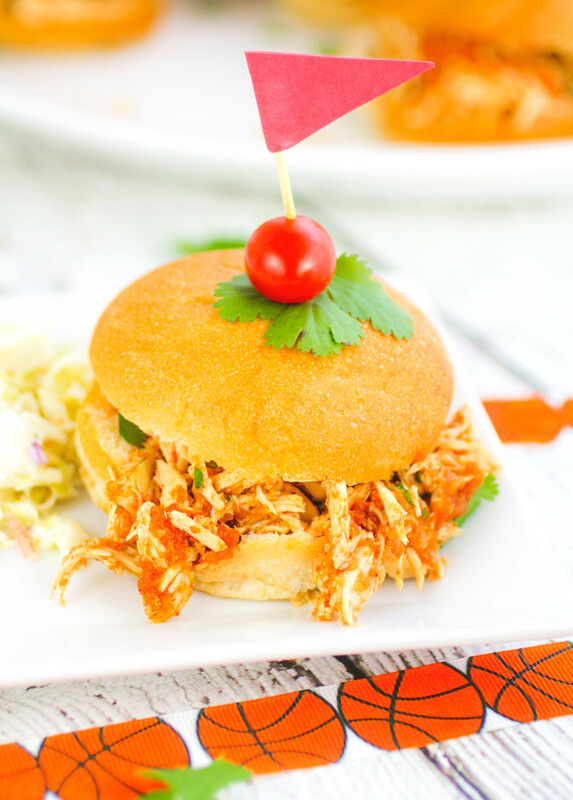 Enter Slow Cooker Southwestern Pulled Chicken Sandwiches. Does it get any easier than using your slow cooker to make a great meal? These chicken sandwiches are super-easy to make and everyone will grab one (or two) to satisfy their hunger. Do you use diced tomatoes for any of the dishes you make? You could use them in my recipe for Shrimp Veracruz or even in these Sausage & Mushroom Stuffed and Grilled Peppers (instead of using marinara sauce). I thought about how versatile diced tomatoes are for so many dishes, and if they include green chiles, they’ll add a bit of a kick to these sandwiches. The slow cooker is ideal to help feed a crowd, because really, who wants to spend hours over a stove when there’s a party going on? These is the perfect sandwich to serve with chips and salsa and guacamole. 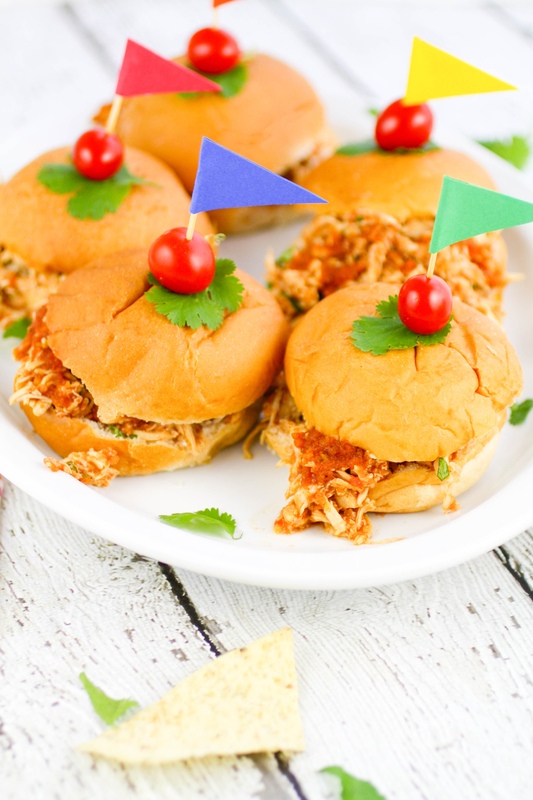 I added onions, garlic, seasonings, cilantro, and lime juice to add a Southwestern feel to these chicken sandwiches – what could be more festive and delicious? If you love cooking with the slow cooker, these Slow Cooker BBQ Beef Sandwiches might be up your alley, too. They’re great for feeding a crowd and so flavorful. Whatever happens with your team during March Madness, this recipe will be a slam dunk with your crowd! 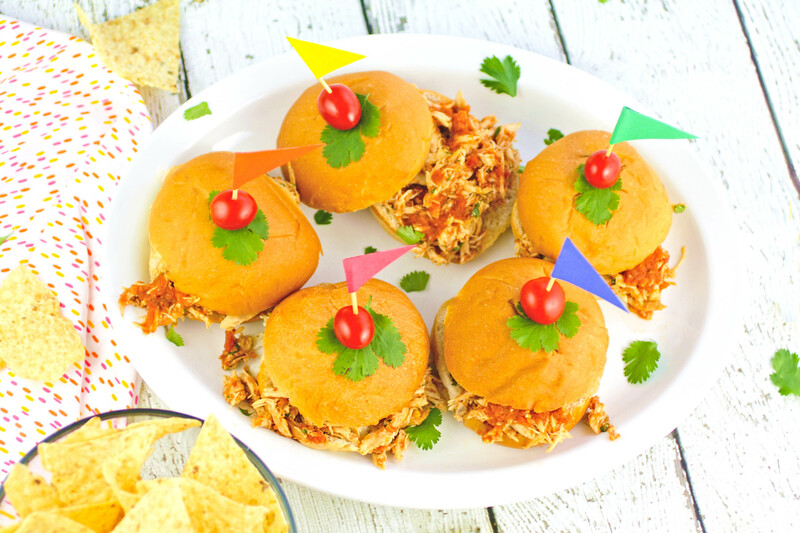 Make a batch of Slow Cooker Southwestern Pulled Chicken Sandwiches when the big game is on. They’re party-perfect! Add the diced tomatoes to a food processor along with the onion, garlic, honey, Worcestershire sauce, coriander, cumin, chili powder, salt and ground black pepper. Add the chicken to the slow cooker set to low heat. Pour the RO*TEL mixture over the chicken, cover with the lid, and cook for 4 hours. Turn off the slow cooker and remove the chicken. Use two forks to shred the chicken into pieces. Add the chicken to a bowl. Squeeze the lime juice over the chicken and add the torn cilantro leaves. Add about 1 cup of the remaining sauce to the chicken, more or less to taste, and mix to combine. Serve the chicken on sandwich buns with extra sauce on the side. Thanks, Johnny! Yes, very good! Thanks, Erica! Hope you enjoy! 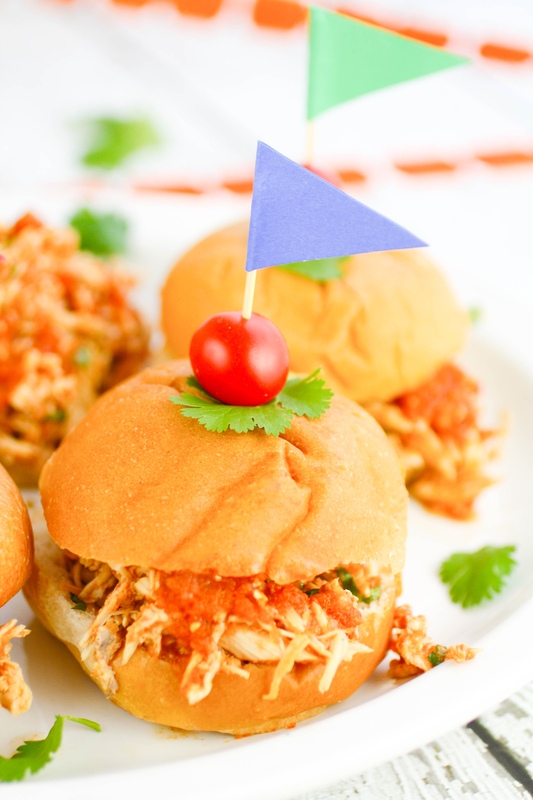 We love a good pulled chicken sandwich in my house! I love the idea of adding Rotel in! Delicious. Thanks, Julia! The RO*TEL adds great flavor! 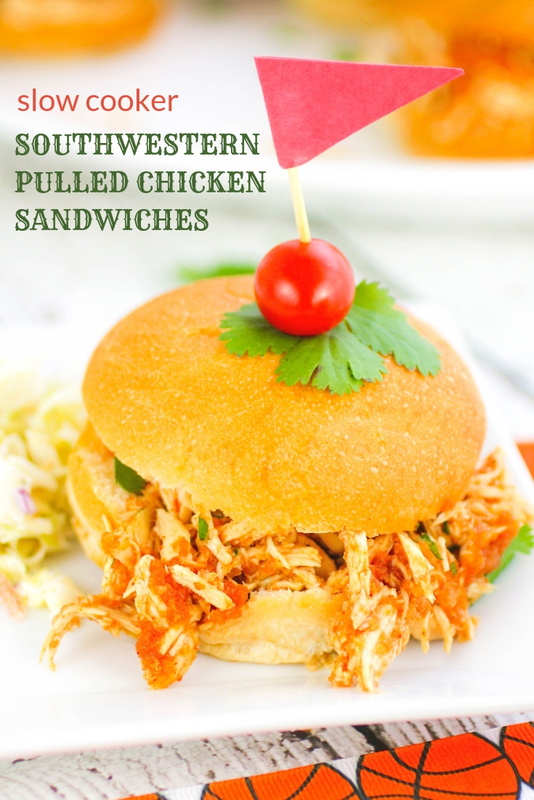 Our family loves pulled chicken sandwiches! These look and sound really yummy. I can't wait to try out the recipe! Thanks so much, Rachel! Enjoy!! These will certainly be a favorite of my husbands! 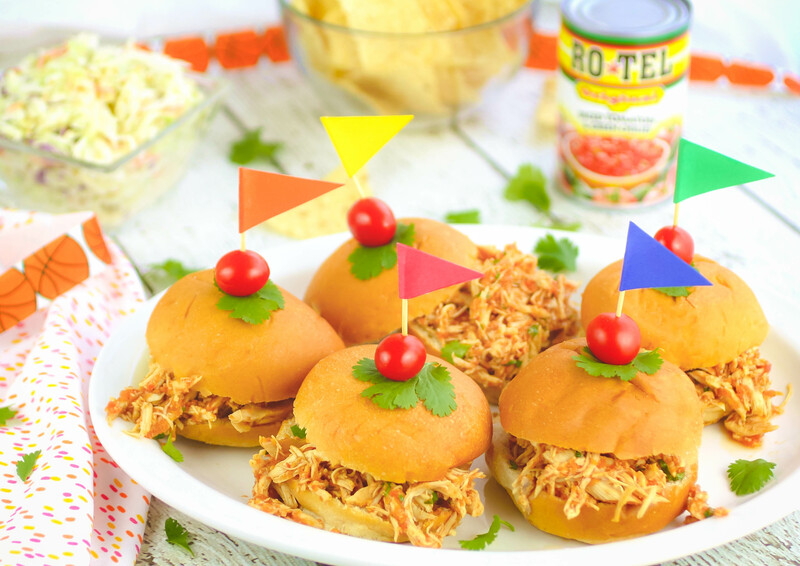 These sandwiches look amazing and I love the use of Ro-tel tomatoes. Need to make these soon! This looks delicious! I love Rotel. Can't wait to try this one, it looks delicious! 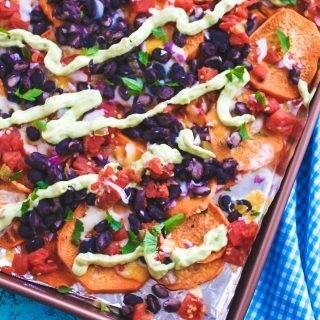 These look delicious and sound really easy! Great game day food!! Pinning!! Thank you, Renee! They sure are easy, AND tasty! 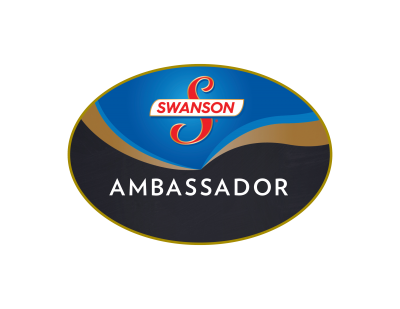 I'm not familiar with the brand but these look really tasty! Now these look like the perfect Game Day slider. 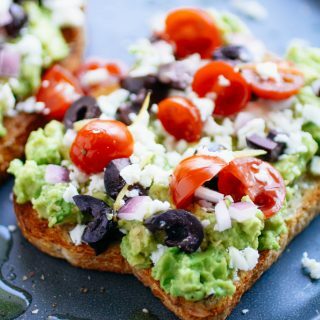 We love Ro*tel and this is a really great recipe for it. Thanks, Libby! Yes, RO*TEL adds so much flavor to many dishes! Oh, these look delicious! I'm going to put this on my must try list! Thanks for a great recipe! Thanks, Sandra! I hope you do! I love doing these slow cooker chicken recipes on sunday and saving for the week. I needed a new recipe and now I have one, thanks!! Hi Lizzy! Hope you give this a try and enjoy! Looks delicious. I love the garlic and honey combo. Thanks, Melissa! I'm a garlic lover, big time! I love using the slow cooker to prepare chicken for sandwiches. I really like the flavors that come together with your sandwich. Ill be trying this! Aw, thanks, Loriann! Appreciate it!! These look great! Alas, my alma mater just missed pulling off a big upset against NC so took the wind out of my March madness sails. Thanks, David! Bummer. My Buckeyes are out, too. I'm a big NBA fan, too, so I still have some games to go til the end of the season! Perfect for a March Madness lunch. I just watched our UCLA Bruins move into the Sweet 16. Yipee! I've never had pulled chicken to date but this looks delicious! Something new to try, Joanne ;) Thank you! Hi Nettie - thanks! Yes! Great idea -- let me know if you try them! Wow these look so good. There's nothing better than slow cooked pulled chicken. I recently bought a slow cooker and I love it! These sandwiches are just the perfect thing to use it for! Oh! All the new things you'll get to try! Thanks so much! This looks like the perfect meal for any night of the week, thanks for a great recipe!! Thanks, Becky! I agree: more time to watch the game! What a fun meal to serve the family...and perfect for March Madness gatherings too! I think next time I want pulled pork, I might try chicken instead! These look good. Definitely, Ashely! Let me know if you try it! Thanks! 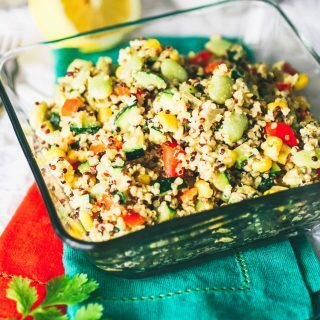 Loving this easy and tasty recipe! Great weeknight meal! These sammies would be so popular at a party! they look so perfect! I think they'd be great for Easter too! Thanks for the recipe. 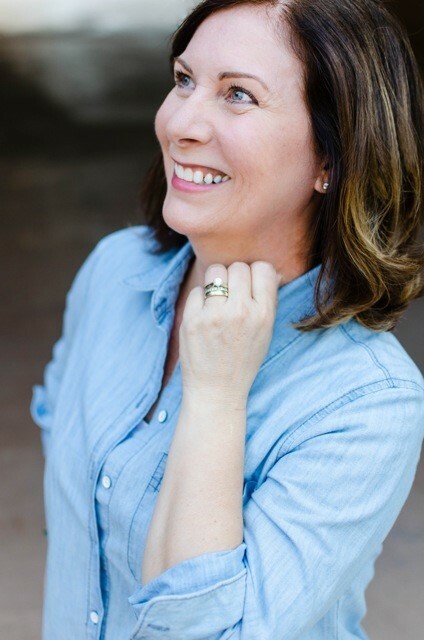 Hey Debi! Thanks so much -- good idea for a potential Easter addition!